Walking in the Cherry Royale Parade -- yeah, that&apos;s me under the big beach ball. Saturday was the final day of the 2013 National Cherry Festival – the day traditionally set aside for the enormous Cherry Royale Parade, where 150 floats, bands and marching units file past thousands of onlookers for two to three hours. 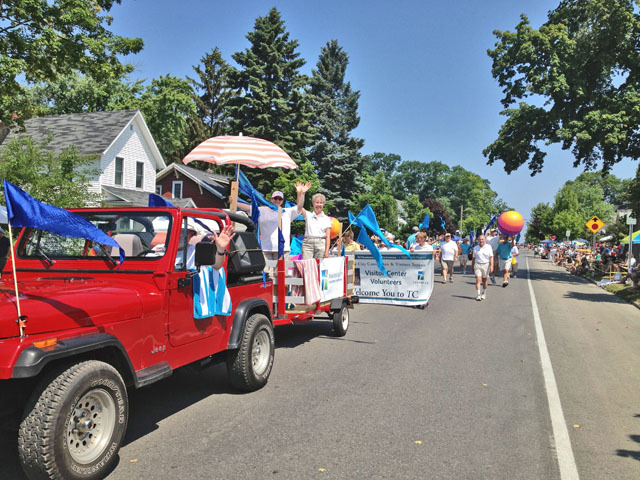 This year, the Traverse City Visitors Bureau decided to march in the parade -- which is how I came to be chasing a giant beach ball down the street in ninety-degree heat. Actually, it was a lot of fun. Sweaty, sticky work, of course – but at least I was wearing shorts and a polo shirt, unlike some of those high school band kids in their black polyester uniforms who were right behind us. And I loved the interaction we were able to have with the crowd: the kids laughing and smiling, the grownups waving at us, the good-natured kidding going back and forth. For me this is a big deal, because sometimes I don’t think people in this town appreciate how much they owe to the millions of visitors we get each year. 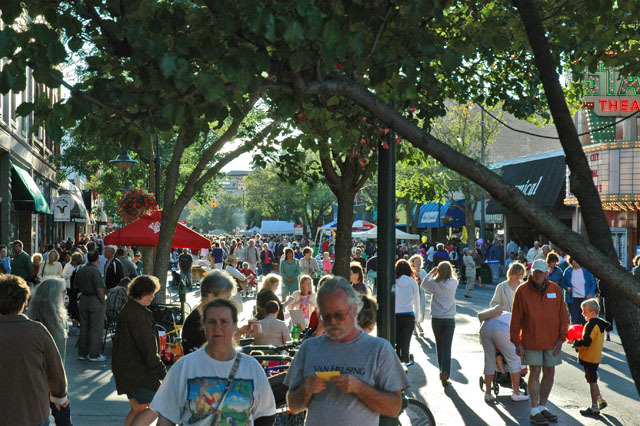 Which is strange, when you realize that tourists bring nearly $1 billion a year to our area, support employment for nearly 14,000 Grand Traverse County residents -- 27 percent of our population – and directly support over 800,000 square feet of retail space in Traverse City. There are just too darn many people here. Especially on the roads. I can relate to this one, because I’m not a crowd person. I like to hike, bike, sail and swim without a lot of companionship. That’s why I live here, and when the beach by my house gets too crowded I stay home and work in the yard. But here’s an interesting factoid – since I live by the beach I can see the license plates on the cars – and most of them aren’t from out of town. I’d say in the height of summer maybe 10 percent of the people at that public beach are tourists. Think about it. Most tourists are staying at hotels that are already on the beach, and they’re paying handsomely for that private spot – they don’t need to go to a park they have to share with us, unless there’s a special reason to go there. It’s the same thing with the traffic on the roads. When I’m driving to work in the morning this time of year, I can see the lights of cars backed up on Three Mile Road to Hammond and beyond. Hundreds of them. It’s the same on M-72 and M-22 to the west, and US 31 to the south. Hey, it’s 7:30 in the morning – those people aren’t tourists – they’re us! There’s a lot more of us now than there used to be – and our transportation system hasn’t changed to keep up with that development, but that’s a different story. There are times and places when the crush of tourists is pretty noticeable, though. I think the corner of Union Street and the Parkway during the week of Cherry Festival is an undeniable example. Nobody likes to get stuck in THAT traffic! But it’s really one week a year, at one – maybe two – intersections. Just think what it’s like at my office, where we have the only public flush toilets for miles. They don’t know how to drive. Yeah, sometimes tourists drive too slowly. Sometimes they stop dead in the middle of the street, or go the wrong way down a one-way or act as if they don’t know where they are. Because they’re lost, or they’re trying to find someplace they’ve never been before. Just the way we are when we’re in an unfamiliar town. Sheesh. They say dumb things and ask dumb questions. Yep, they do. People come to the end of the Old Mission Peninsula and ask where the ferryboat to Charlevoix is. People ask about whale-watching trips in the Bay. Well, this is like the driving – sometimes they’re just honestly ignorant, and sometimes they’ve been made the victims of local folks who think they’re being funny. Either way, we could see ourselves doing or saying stuff like this if we were strangers in somebody else’s town. Everybody’s a visitor somewhere. They create a big financial burden on local government. It’s true that visitors don’t pay property or income taxes to local government. But the hotels, restaurants and shops they use -- hotels, restaurants and shops that wouldn’t be here without them – do pay taxes. An estimated $3.1 million to the city of Traverse City and an estimated $9.8 million to Grand Traverse County in 2006 – the last year we studied. You think those guys pay their taxes out of their own pockets? Of course not – they pass the cost along to their customers. The tourists. And except for driving on our roads, tourists use almost none of the services our tax money pays for. They don’t have kids in our schools, they don’t take books out of our libraries, they don’t ride the BATA buses, they don’t have housefires that need to be put out by our firefighters. Far from being a drain on local government, tourism actually generates far more tax revenue than it requires in infrastructure and services. Over a 20-year period, we estimate that Traverse City receives a $4 million annual net surplus from the tourism industry, while the county receives an estimated $11 million annual surplus. The average county property owner, as a result, pays on average $232 less a year in local taxes because of tourists. City property owners do even better: they pay an average of $667 less per year because of taxes paid by tourists. Some tourists are rude, it’s true. They make unreasonable demands, are abusive to hotel and restaurant employees and toss their trash around. So do some locals I know. But when it comes to environmental damage, some strong words need to be said in defense of tourists. Remember, I live across the street from the beach; on summer mornings I go out to pick up the trash -- and I know where that trash comes from. I know who has the late-night parties. It ain’t the tourists. There are always exceptions, but it’s almost never the tourists. Think about it for a second. Who’s most likely to trash a place – somebody who’s seeing it for the first time and is completely blown away by the beauty and splendor of it, or somebody who’s grown up here and doesn’t even notice anymore how beautiful it is? I find our tourists much more respectful of their surroundings – even the teenagers – than many of the locals. The other thing is to remember that almost everyone in the tourism industry is committed to a business model that values sustainability and natural beauty. This whole wonderful tourism mechanism only works as long as people want to come here and experience the natural beauty and purity that we enjoy. Any business model that threatens the environmental quality of the area threatens the source of our prosperity. It’s not rocket science – local business leaders understand this. From a strictly environmental standpoint, in fact, tourists are the ultimate renewable resource. They’re not a factory belching smoke; they’re not a forest you have to grow for 30 years before you can harvest it; they’re not a mining operation that leaves you with polluted water or a hole in the ground. They arrive every year, cheerfully give us their money and then go back home to earn some more so they can come back and give it to us all over again. Lunch at the Jolly Pumpkin in Old Mission. They take up all the good seats in the restaurants. Here’s a thought: your favorite bar or restaurant, your favorite concert series, retail store, coffee shop or bookstore, probably wouldn’t be here if it weren’t for tourism. 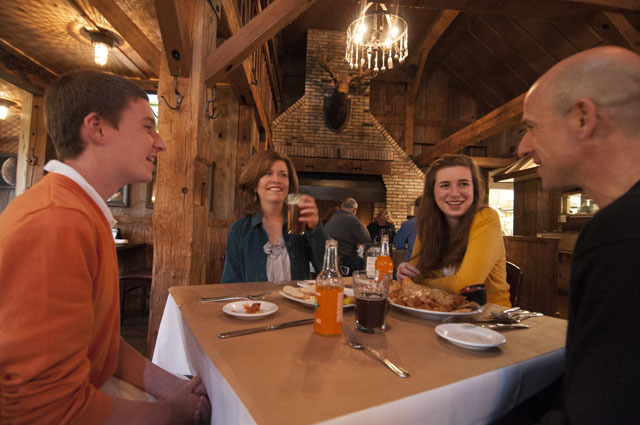 By itself, Traverse City’s population is too small to sustain the cultural, culinary and social amenities we’ve come to enjoy. They exist here because tourists add their numbers to the mix and make those amenities financially viable. We get to enjoy an elevated quality of life because tourists come here. What this all comes down to, of course, is that most of us originally came from someplace else. We came here as tourists ourselves, decided we liked the place, and moved up. And like most parvenus, we’re more than a little uncomfortable with our status. We want to fit in and act like locals – and what better way than to complain about tourists? It’s like we’re finally the cool kids, and they’re the nerds. But if these problems aren’t really such big problems, what are the major sticking points in the relationship between locals and visitors? I can think of a few -- and I’ll talk about those items next week.